A shortcode is code similar to HTML, but is Pressbooks-specific and allows you to easily insert formatting or content elements. Shortcodes are typically easier to use than HTML and can be used both in the Visual Editor and in the Text editor. For most users, inserting content via the Visual Editor will be the easiest option. However, for users whose workflow involves importing Word documents into Pressbooks or copy/pasting from a manuscript written in a different editor, shortcodes are a convenient way to insert or format content elements that are Pressbooks-specific. Most of these shortcodes support custom classes. For more information on applying custom classes, see the “Applying Custom Classes” section at the end of this chapter. Caution: please do not directly copy/paste the code displayed on this page as it contains special characters that force the shortcodes to be displayed as text instead of being properly rendered. Instead, retype the shortcode in your chapter. Description: Formats the text as a heading (h1) or subheading (h2). Note that the “heading” is not the chapter title, but the next level of headings. Custom classes may be applied to this shortcode. Description: Formats the text with fixed-width font. HTML tags can be displayed if they are entered in the visual editor (Pressbooks will automatically convert them to HTML character entities). The code can also be a block. 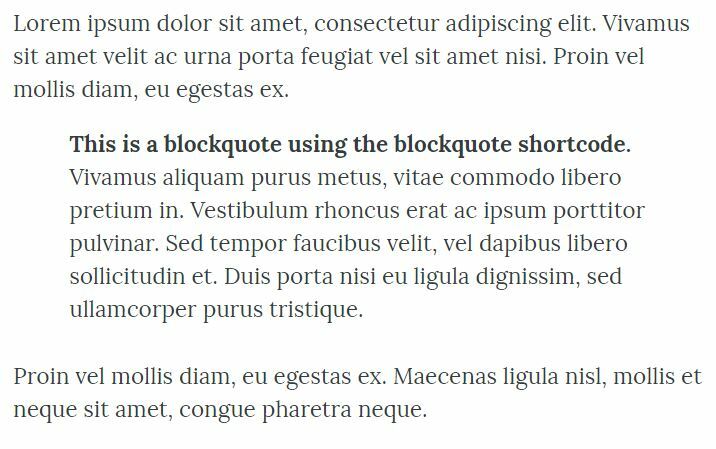 Note: for the second example above, the text needs to be entered in the Text Editor, with no extra blank lines between lines of text, otherwise it will not display correctly. Description: Formats the email address into a proper email link. This shortcode has multiple variants. Description: Treats the content as latex code and renders it using PbLaTeX, or QuickLaTeX if the plugin is enabled on the book. 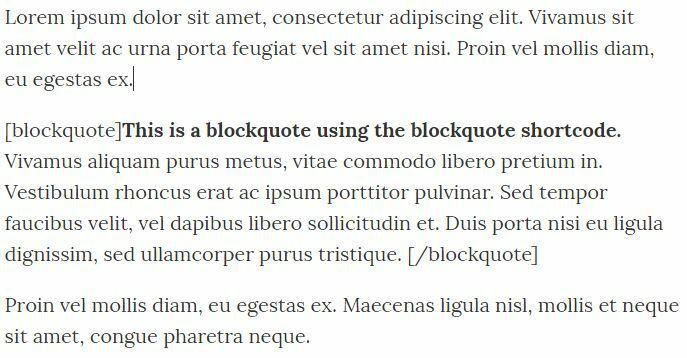 Description: formats the content as a block quote. Description: Formats text into a footnote. In the visual editor, the footnote text, wrapped in the shortcode, should be placed where the footnote reference number should be located, and not at the end of the chapter or page. This leads to a footnote[footnote]This is the footnote content. [/footnote]. Description: Creates an anchor which can then be linked to via href=”#anchorname”. The ID is required. It is recommended to only use letters, numbers, hyphens (-) and underscores (_) in the ID. A custom class may be applied to this element. Note: by default, the anchor is “invisible”; it is displayed without any visual element associated with it. Description: Wraps the text inside a box with an outline. Depending on the selected theme, the box may have a background color. The preset “shaded” class or custom classes may be applied to the textbox shortcode in order to change the appearance upon display. Description: Formats text in 2 or 3 columns. If the number of columns is not specified, or is a number other than 2 or 3, the text defaults to 2 columns. Description: Embeds media content (usually videos) in an iframe, with an optional caption. The video must be oEmbed-compatible. Please note that videos do not support alt-text. Description: formats text as a caption. This is used usually with an image. This is a WordPress built-in shortcode. For more information, please consult the WordPress documentation on the Caption shortcode. The caption shortcode requires the Width parameter to work. The width indicates the width of the caption in pixels. Notes: The caption shortcode can be inserted via the Visual Editor, and will look like the image on the left. If you then switch to the Text Editor, and back to the Visual Editor, the content will be updated to look like the image on the right, even in the visual editor. Description: This is a WordPress built-in shortcode that displays a series of images as tiles, in an image gallery. The shortcode only works with image IDs, which are only assigned after the images are uploaded into Pressbooks. Unless otherwise specified, the images automatically link to the attachment page for each image. For more information on the various options available with this shortcode, please consult the WordPress documentation on the Gallery shortcode. Please note that the Pressbooks themes do not currently support image galleries, which means the design of the image gallery will be very basic and it may not work will all export formats. Description: This is a WordPress built-in shortcode that allows setting height and width parameters on embedded media content (videos, audio, and other interactive content). All content supported by the embed shortcode can be embedded by directly pasting the URL into the visual editor. If you wish to set a custom height and/or width, you may do so using the embed shortcode. For more information on usage and supported sources, see the WordPress documentation on the Embed shortcode and our user guide chapter on embedded content. Please note that content not supported by the embedding feature will display as a regular link. If you are familiar with CSS, you may apply custom classes and use custom CSS to modify the appearance of some of the elements. Shortcodes that support custom classes are indicated in the descriptions above. Custom classes in the shortcodes work the same way as custom classes in HTML, by adding class="". Shortcodes by admin is licensed under a Creative Commons Attribution 4.0 International License, except where otherwise noted.